We’d love your help. 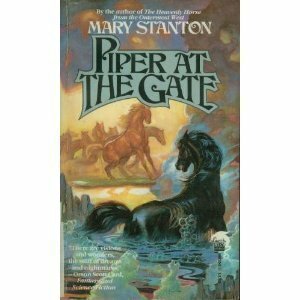 Let us know what’s wrong with this preview of Piper at the Gate by Mary Stanton. The sequel to Mary Stanton's first novel, "The Heavenly Horse from the Outermost West", this novel continues the story of the desperate struggle for survival of the sacred Appaloosa breed of horses against impossible odds. To ask other readers questions about Piper at the Gate, please sign up. This book, the sequel to The Heavenly Horse from the Outermost West, was ridiculously well-loved by me as a kid, and it has stood up to re-readings as an adult well enough, though I don't revisit it as often as its prequel. It's another fantasy set in the realm and mythos of equines, filled with warring gods and brave mortals in peril. A well-done, worthy sequel for an excellent book. Even better than the first book. This story revolves around Piper, the first son of Duchess and The Dancer. Piper is called on to rescue his sire and dam after they've been tricked onto the green path, and into a sort of limbo, by the Dark Horse. I adored this book. It reminded me of Watership Down, in like the best of all possible ways! I can't wait to find the first one! No review: its been a while since I read this: 15 years or so?! I feel like I must have read this. I've read the first one about 3 times. But I honestly can't remember anything about it at the moment, except the cover. So it is on my 'to-read' list. A horse tale with a twist. Very much so along the lines of Watership Downs but with less of an appeal to stop ecological destruction and a lot more fantastical elements. Read this book when a was younger, and I still think of it as one of the best books I ever read. Mary Stanton was born in Florida and grew up in Japan and Hawaii, after which she returned to the United States and received a B.A. in Philosophy and Literature from the University of Minnesota. Stanton’s career as a fiction writer began with the publication of her first novel, The Heavenly Horse from the Outermost West, in 1984. A beast fable similar in tone and theme to Watership Down, it was pub Mary Stanton was born in Florida and grew up in Japan and Hawaii, after which she returned to the United States and received a B.A. in Philosophy and Literature from the University of Minnesota. Stanton’s career as a fiction writer began with the publication of her first novel, The Heavenly Horse from the Outermost West, in 1984. A beast fable similar in tone and theme to Watership Down, it was published in the United States, the United Kingdom and Japan. The sequel to that novel, Piper at the Gates, appeared in 1989. She sold her first mystery to The Berkley Publishing Group in 1994. In all, Stanton has written nineteen mystery novels, two adult fantasy novels, eleven novels for middle-grade readers (including the successful series, The Unicorns of Balinor), and three scripts for a television cartoon series, Princess Gwenevere and the Jewel Riders, as well as edited three short story anthologies. Her nonfiction articles on horse care and veterinary medicine have appeared in national and regional magazines. Stanton's newest series, The Beaufort & Company Mysteries, was launched in December 2008 with the publication of Defending Angels. Set in Savannah, Georgia, the paranormal mysteries chronicle the adventures of Bree Winston-Beaufort, a young lawyer who inherits her uncle's law firm and its deceased clientele, whom she represents in appeals before the Celestial Court. The second book in the series, Angel's Advocate, was published in June 2009, followed by Avenging Angels in February 2010. Mary also publishes the Hemlock Falls and Dr. McKenzie mysteries under the name Claudia Bishop. See the Claudia Bishop web site for more information. Stanton’s interests outside writing have remained consistent over the years. She is a horsewoman, a goat aficionado, an enthusiastic (if inept) gardener, and a fan of gourmet food, but not an expert. She has developed a writing program for teens and middle grade readers that has had considerable success in schools.